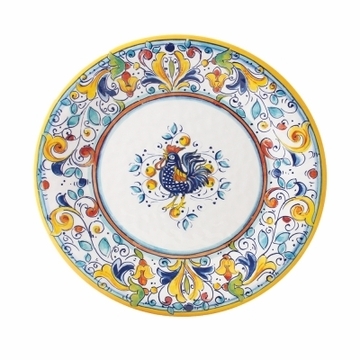 Lovers of all things French will adore this pattern by Le Cadeaux: crisp and fresh with gorgeous floral detail, Florence dinnerware features a stylized rooster in the center of each piece. Mix this bold, feminine pattern with your favorite solids, or make a statement with full settings of Florence for a whimsical table. Le Cadeaux dinnerware looks like handpainted ceramic, but it's actually triple-weight melamine that's virtually unbreakable. It's also dishwasher safe, but we don't recommend using it in your microwave.